Bulimia Nervosa (often called just bulimia) is a serious eating disorder in which a person engages in food binges, then tries to eliminate the calories consumed through a variety of unhealthy means. What people do not realize is that self-induced vomiting not only affects your general health such as ulcers, anemia, blood pressure irregularities, but also your oral health. The data shows that Bulimia affects 1-3% of teens in the USA. Bulimia is a very serious eating disorder and if you suspect that you may be suffering from bulimia is important to seek professional medical, mental health, and dental treatment. Damages to your teeth will persist as long as you have bulimia. If you are resolved to recovery and are looking for a dental professional to restore your damaged teeth, we are committed to compassionate and confidential care. Please call (949) 364-9600 or of Mission Viejo today for an appointment. The term Bulimia comes from the Greek word for “ravenous hunger”. 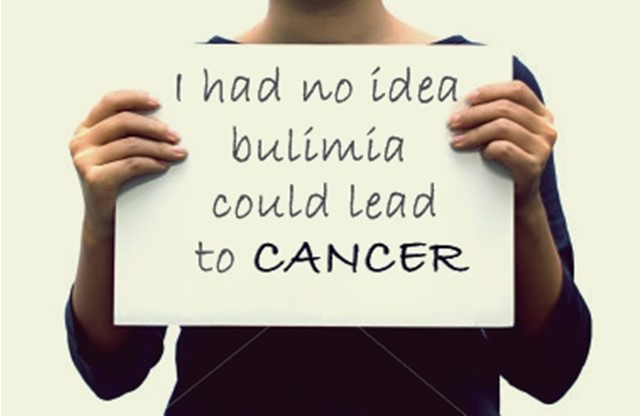 Bulimia is a type of eating disorder in which a person binges by eating a large amount of food in a short period of time followed by trying to eliminate calories consumed through a variety of unhealthy means. People with bulimia often have anorexia Nervosa, in which is characterized by significant unhealthy weight loss resulting from a restriction in calories due to fear of weight gain. They are generally two types of bulimia: purging and non-purging. In purging bulimia, people rid their body of unwanted calories by vomiting or using excessive laxative or diuretics. In non-purging bulimia, people attempt to eliminate calories by fasting, strict dieting, or exercising excessively. The resulting damage to the mouth and teeth can often be the first telling sign of a chronic eating disorder. The quality of life that a person suffering with bulimia can be severely hampered with dental and oral disorders. Repeated vomiting erodes the attractive and protective outer layer of the teeth, called teeth enamel. When enamel erodes, the dentin which is less attractive and softer gets exposed and ultimately causes teeth sensitivity. The erosion also exposes teeth to further damages such as decay caused by bacteria and chipping or cracking caused by biting or chewing. Damage to the enamel can be worsened if a bulimic tries to control bad breath from purging by brushing teeth because teeth enamels are softened by stomach acid during vomiting and are more vulnerable to wear by brushing. Repeated vomiting also affects the soft tissue in the mouth. Salivary glands are damaged, in which will cause dehydration and ultimately dry mouth. The gum and other surfaces in the mouth such as palate may be sore and bleed. Untreated cavities could lead to more serious health conditions, and bleeding gums could be reflective of periodontal disease. Vomiting is not the only aspect of bulimia that can lead to teeth damage. Bulimics often engage in numbers of unhealthy habits that can damage teeth. One common habit is the use of high-citrus diet such as lemonade cleanse to reduces calories. High citrus diet can be as bad for teeth and causes loss of enamel, which is the translucent and thin outer covering of the tooth. The enamel is the hardest tissue in the human body and covers the crown which is the part of the tooth that is visible outside of the gums. As stomach acid are purging on purging bulimic, it damages the enamel and causes many issue, including cavities. Excessive levels of excessive can also be damaging to teeth. When bulimics exercise excessively, the pH levels of their saliva may drop and become more acidic, which will ultimately can erode teeth. Bulimic people usually experiencing dehydration. The dehydration associated with bulimia can reduce saliva production. With decreased saliva, bacteria will thrive in the mouth, causing more cavities and gum disease. Binging Eating Disorder (BED) is characterized by eating a vast quality of food, usually revolves around types of foods which are very high in sugar and fat but are relatively low in real nutrient value. BED behavior can also lead to damage to your teeth due high-sugar food which can feed bacteria, resulting in an increased risk of cavities. Because of secretive nature of binges, oral care is neglected, which can lead to increased damage. Dental practitioners can be an instrumental health professional in identifying the early signs of bulimia, which are often displayed in a person’s mouth and in the condition of their teeth. In some instances, an individual can live with bulimia for years before receiving help or being officially diagnosed with this mental health disorder. Talk with Dr. Horiyat about your dental concerns and take the steps toward receiving comprehensive treatment for bulimia recovery. The first step in controlling teeth damage from bulimia is to start getting treatment. Until your bulimia is under control, only provisional dental care may be undertaken. This can slow damage to your teeth but cannot stop it. 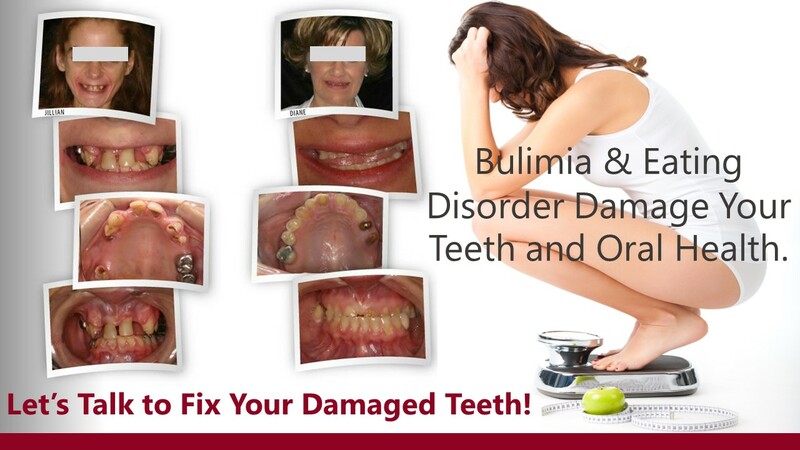 Once your bulimia is under control, we can begin bulimia teeth repair. With advanced cosmetic dentistry procedures, we can give you an attractive smile that shows no evidence of your former condition. Want to talk to Orange County top cosmetic dentist about bulimia tooth damage? Please call (949)364-9600 or email us in Mission Viejo for an appointment.